Saturday and Sunday afternoons you will find my wife and I biking along the Rio Grande river! What a wonderful afternoon! There is a black topped walk/bike path that begins at Alemeda NW and Rio Grande NW and goes all the way to South of Central by the Zoo. Seeing the North Valley homes in Albuquerque offers all kinds of little surprises that make your time there special. 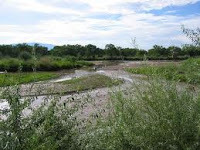 In addition to the bike paths there is a great nature center at the West end of Candelaria NW. It's a special place for Adults and children alike. There Farmer's markets providing fresh vegetables, Wine festivals featuring fine wines of New Mexico, and even a Lavender featuring everything Lavender. There are horses, cows, chickens, and camels (yes a camel!). A rural area fighting the encroachment of the city! This is another great choice as a place to reside. If you are a horse lover there are places throughout the valley that offer great riding along a ditchbank.